Although fatigue is sometimes described as tiredness, it is different to just feeling tired or sleepy. Everyone feels tired at some point, but this is usually resolved with a nap or a few nights of good sleep. Someone who is sleepy may also feel temporarily refreshed after exercising. If you are getting enough sleep, good nutrition and exercising regularly but still find it hard to perform everyday activities, concentrate or be motivated at your normal levels, you may be experiencing fatigue that needs further investigation. There are a number of diseases and disorders which trigger fatigue. If you experience prolonged bouts of fatigue, consult your doctor. Lack of sleep – typically adults need about eight hours of sleep each night. Some people try to get by on fewer hours of sleep. 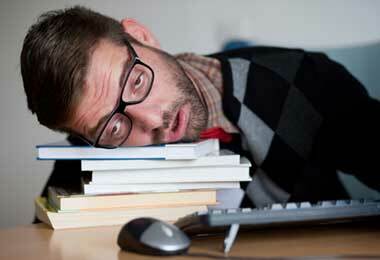 Too much sleep – adults sleeping more than 11 hours per night can lead to excessive daytime sleepiness. Alcohol and drugs – alcohol is a depressant drug that slows the nervous system and disturbs normal sleep patterns. Other drugs, such as cigarettes and caffeine, stimulate the nervous system and can cause insomnia. Sleep disturbances – disturbed sleep may occur for a number of reasons, for example, noisy neighbours, young children who wake in the night, a snoring partner, or an uncomfortable sleeping environment such as a stuffy bedroom. Lack of regular exercise and sedentary behaviour – physical activity is known to improve fitness, health and wellbeing, reduce stress, and boost energy levels. It also helps you sleep. Poor diet – low kilojoule diets, low carbohydrate diets or high energy foods that are nutritionally poor don’t provide the body with enough fuel or nutrients to function at its best. Quick fix foods, such as chocolate bars or caffeinated drinks, only offer a temporary energy boost that quickly wears off and worsens fatigue. Individual factors – personal illness or injury, illnesses or injuries in the family, too many commitments (for example, working two jobs) or financial problems can cause fatigue. Poor workplace practices – can add to a person’s level of fatigue. These may include long work hours, hard physical labour, irregular working hours (such as rotating shifts), a stressful work environment (such as excessive noise or temperature extremes), boredom, working alone with little or no interaction with others, or fixed concentration on a repetitive task. Burnout – can be described as striving too hard in one area of life while neglecting everything else. ‘Workaholics’, for example, put all their energies into their career, which puts their family life, social life and personal interests out of balance. Unemployment – financial pressures, feelings of failure or guilt, and the emotional exhaustion of prolonged job hunting can lead to stress, anxiety, depression and fatigue. Depression – this illness is characterised by severe and prolonged feelings of sadness, dejection and hopelessness. People who are depressed commonly experience chronic fatigue. Dr. Boxall’s offers one of our best-sellers REBOOT in order to take away any feelings of Fatigue.